Film: "Who Were The Marchers?" 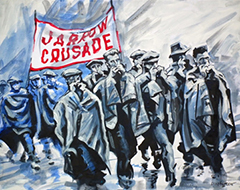 The Jarrow Crusade is a legendary event that took place in 1936 and captured the imagination of a nation. During 2016 there will be a range of events and activities that will commemorate the 80th anniversary of the Crusade, drawing out its relevance for today and exploring the personal stories of a number of the marchers.